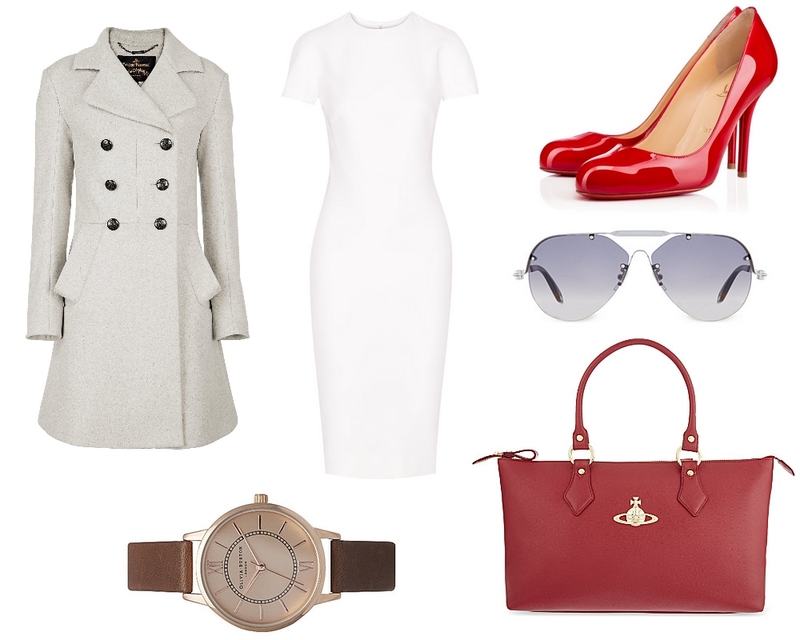 Coat – Dress – Shoes – Sunglasses – Bag – WatchLately I’ve been dreaming about winning the lottery, but don’t we all? I’m lusting after quite a few luxury items by some of the world’s top designers. Just to clarify, this wishlist includes clothing and accessories from my favourite designers, I’m not just picking random things for the designer name. I think this would actually go together really well as an outfit, but that was unintentional! It’s fair to say this is a dream wishlist as the contents total up to £3,108. A girl can dream! Vivienne Westwood Anglomania Corgi Coat – I am a huge lover of coats and this gorgeous Vivienne Westwood one is no exception. It looks so warm and cosy, I love the light colour because it looks so fresh and bright. I reckon it would look great with any outfit, especially tights and boots for the most stylish and warm Autumn/Winter look. Victoria Beckham Silk and Wool-Blend Crepe Dress – I love this simple, elegant, sophisticated dress. Victoria Beckham’s designs are so classic but still have that modern feel. It would be a staple piece in my wardrobe if I owned it. I could throw it on with any jacket or coat and some gorgeous heels, it would look wonderful. Christian Louboutin Sophiaregina Patent 100mm Pumps – I am obsessed with Louboutin’s and I vowed to myself that I wouldn’t buy a pair unless I won the lottery. However, I think I may have to break that and buy myself a pair for my 21st or for passing my driving test when I do! Givenchy Seventeen Aviator Sunglasses – Givenchy are my favourite designers for sunglasses and I love aviators. They’re stunning because they’re so simple and because there’s no particular colour to them, you can wear them with any outfit. Plus sunglasses are an essential…so why not splurge on them? Vivienne Westwood Divina Saffiano Tote – This bag. It takes my breath away! I couldn’t imagine a bag that could be anymore perfect for me. My favourite colour to wear is red which is probably obvious by now and it is by my favourite designer. I don’t think I’d ever buy another bag if I owned this one, the size, the colour, everything about it is perfect! Olivia Burton Wonderland Rose Gold Plated Watch – Olivia Burton watches have been so popular over the past few months. I love the big faces on them and the leather straps, this one is so much more stylish than the watch I’ve got at the moment! Anything rose gold and tan coloured makes me swoon, so when I saw this I knew it had to be included in my wishlist. Next Post Esthechoc Cambridge Beauty Chocolate | Chocolate Skin Care? !